Government yesterday launched the consultative process on the Planning and Budget Policy which will culminate into the development of the Planning and Budgeting Bill. The policy and ensuing Act is intended to make provisions that anchors national development plans as benchmark documents to inform national budgets to an extent that the national budgets will become tools for operationalizing national development plans. This means that resources will be allocated and appropriated in line with projects and programmes contained in national development plans as a matter of priority. The document is embedded below. Government has issued Statutory Instrument 55 of the Bank of Zambia (Monitoring of Balance of Payments) Regulations, 2013. This was issued this week and revokes and replaces Statutory Instrument 32 of the Bank of Zambia (Monitoring of Balance of Payments) Regulations, 2013. The new SI 55 comes into effect on 1 July 2013. I have not fully studied this but off a quick skim it appears to contain several compromises. The income repatriation period is now 120 days not 60 days. The export and import regulations now applies to transactions above $20,000 not $10,000. And whilst in the past all Regulations applied to any financial transfers above $5,000 that line has been removed and restrictions now only appear to apply only to import and exports. In addition there's new discretion in relation to new investors qualifying for incentives. I'll leave to others to delve deeper into these issues. But its unfortunate that GRZ has not explained these changes to the public and people are being left to figure it out for themselves. Indeed, even though some of the changes make some sense they have not explained on what basis these changes have been made. Minister for Transport Yamfwa Mukanga MP earlier this week delivered a ministerial statement on the dissolution of the Zambia Railways Limited Board and the recent retirement of Managing Director Clive Chirwa. Full statement is embedded below and can also be found at Parliament Online. Government has released further detail on the Budget performance to date. Please note that all figures are in Kwacha Rebased (KR) even though some appear with only "K". I have clarified the drafting error with the Ministry of Finance. From July all figures will be in "K" only when the KR is eliminated. This briefing provides a little more detail than last time. Presentationally the briefing can do with a simple table of allocations so that people can see the various categories more clearly. Crucially people need to see when spending is being made against the "reserve fund". It would also be good to see forecasts on where new commitments outside the Budget are likely to place spending in general e.g. what does the rampant bye-elections and huge commitments on civil service pay award mean for the fiscal position going forward? This is what people want to know not merely historical data. Nevertheless so far so good. This is much better information than we have had previously and the Government is to be applauded. But it is important that Government responds to the public who use data and not merely provide what they wish to provide. More good news for Ndola residents on the power front. Ndola Energy is nearly finished with the $60m construction of the heavy fuel power. The plant will begin generating power next month to cushion the Ndola's current power outages. 90 per cent of works has been done and Zesco has already started putting up transmission lines to connect the power plant to the Zesco Skyways sub-station and sold to Ndola-based electricity consumers. It will be commissioned in July with full operations in August. Ndola Energy will be pumping residual heavy oil from Indeni Oil Refinery into the two 2000 cubic-metre tanks to operate its six generators which have already been installed. The plant is situated in Ndola's heavy industrial area adjacent to Indeni Petrolium Refinery and TAZAMA Pipelines national oil distribution terminal. This is a great project for three reasons. First, it is another private sector led project in the generation front. Long may it continue. The more ZESCO can focus on the transmission and distribution the better! Secondly, it continues the ongoing re-emergence of Ndola as an economic centre. Reliable power is key to economic activity. And of course it also adds a few jobs on the table. Finally, as well as increasing Zambia’s generation capacity, the new plant addresses the challenge of storage space at Indeni, where HFO is stockpiled due to limited demand. Ndola City Council (NCC) and a Chinese firm Henan Gouji have signed a memorandum of understanding for the construction of more than 2,000 houses at Dola Hill site opposite the Levy Mwanawasa Stadium. The construction would include a hospital and two five-star hotels. The housing project is estimated at $200m. The project is expected to start at the end of September and would create more than 1,000 temporary construction jobs for the local people. Last year the suggestion was 1000 houses and only one five star hotel! It appears they are doubling the capacity of everything. Hyperbole? We must wait and see. As I understand it, the plan last year was for the company to ask people interested in buying the houses to pay 20 per cent before it starts building and another 20 per cent when it finishes the construction and the rest was supposed to be paid in form of mortgages at very low rates. It is unclear whether that is still the plan. Government has now commenced publication of treasury briefs which are aimed at providing more information to the public on the implementation of the annual budget. Below are the main highlights. It seems rather brief and does not really give a detailed enough picture to monitor and evaluate where the money is going. One hopes Government will do more than this in the future. At the very least we need to know ministry by ministry. It would also be good to see forecasts on where new commitments outside the Budget are likely to place spending in general e.g. what does the rampant bye-elections and huge commitments on civil service pay award mean for the fiscal position going forward? This is what people want to know not opaque summaries. ZAMPALM, a newly created subsidiary of Zambeef Products located in Mpika district of Muchinga Province will create 2,000 new jobs next year as the company starts harvesting fruits and processing palm oil. The company has invested about KR 7.5 million on its palm oil plantation in Mpika from part of its US$ 41 million total investment for the palm oil production which will include the setting up of a cracker to process the palm oil. ZAMPALM's Trusted Mwiinga says the project is on course. ZAMPALM has a 20,000 hectare plantation which was set up in Mpika. It will process around 100,000 tonnes of palm oil per annum when fully operational. Government says more than 1,000 jobs are expected to be created from the aquaculture projects in Siavonga (Southern Province). Siavonga DC Brave Mweetwa says so far two large scale fish farming companies have set up investment in the district which will offer employment creation opportunities for the local people. Zimbabwe's Kariba Harvestors is which started operating the Kajojo Fishing farm plans to employ more than 700 employees once fully operational. Another firm Yalelo fishing company working in Kamimbi area already employs 250 people and is expected to add an additional 400 in due course. Japan's Toyota allegedly plans to set up a mega fertiliser production plant in Zambia. According to Zambia'a Ambassador to Japan Mwelwa Chibesakunda, Toyota is keen invest in agro input production in Zambia, as part of its diversifcation programme away from its traditional car manufacturing. About three weeks ago, officials from Toyota Japan allegedly met Mr Chibesakunda and told him that they were interested in investing in Zambia’s agriculture sector by setting up the fertiliser manufacturing plant. He says the investors have already been to the Nitrogen Chemicals of Zambia (NCZ), the country’s only local fertiliser producing firm in Kafue, to look at the facility which has been struggling financially. Apparently they were not impressed with what they found there and indicated that the equipment NCZ was currently using was outdated. In his words : “I am not their spokesperson, but from the look of things, they will not invest in the revival of the NCZ in Kafue because the equipment is ancient. The machinery is so outdated that they may need something new". This is one of those stories that one should treat with extreme caution. Apparently Toyota is already in talks with the Zambia Development Agency and other officials from the Ministry of Commerce, Trade and Industry on the planned venture. If this went through it would clearly signal the death of NCZ. GRZ in April 2012 announced that it planned to privatise the crippled Nitrogen Chemicals of Zambia because it has no money to revitalise it. The then Agriculture Minister Emmanuel Chenda sad the cost of revamping was above KR1.6 billion - effectively the entire operational budget of the whole ministry. But that decision annoyed local PF leaders who suggested it showed a "lack of vision and proper planning" and a break of campaign promises. And NCZ continues to limp on. ZAMPOST is finally on the road to recovery. The company which has previously been plagued by inefficiency and corruption recently announced that it has recorded a profit of KR 1.35 million for the first time since 1994. We managed to make a profit due to a strong performance resulting from a conscious and result-oriented culture the management has built. The month- on –month incremental financial performance shows that we are beginning to operate profitably. The current Medium Term Expenditure Framework 2013-15 has a rather interesting line: “Personal emoluments in the medium term, as a share of GDP, are projected to decline from 9.1 percent in 2013 to 8.8 percent in 2015. The spending pattern on personal emolument is consistent with Government’s strategy to contain the wage bill within sustainable levels and ensure sufficient fiscal space for developmental programmes” (Source: MTEF 2013-15). Someone forgot about this line because in March 2013 there was a bumper pay rise for civil servants with some (not all) getting as high as 200 percent effective September 1, 2013. Leonard Hikaumba, president of the Zambia Congress of Trade Unions, revealed then that on average most workers will get increases of 40 percent to 50 percent. Another presentation from the Zambia's first ever Emeralds International Conference held last month. This presentation is from the Zambia Revenue Authority. It has a useful chart on the main sources of tax revenue in this sector. Predictably, Kagem appears to pay 80% of the tax revenue. One gets the sense that the biggest challenge for Government is to deal with illegal traders not showing in the numbers. Unfortunately, there appears little activity on that front. The North-West Railways project appears to be on the verge of being realised. Government will soon sign a memorandum of understanding (MoU) with promoters of North-Western Railway to pave way for the start of vonstruction of railway line in the mining region to ease transportation of copper and other goods. North-West Rail project is promoted by a group of Zambians, who hold 65 percent shares under North-west Rail Company (NWR) with Enoch Kavindele as CEO, 20 percent shares held by three Americans, five percent shares from United Kingdom and 10 percent shares by South Africans. NWR holds a railway line licence for construction and operating a rail from Chingola through Solwezi to Lumwana with the second phase planned to extend to Angola's Benguela line. The development is expected to cost around US$1.1 billion is expected to start in July following the approval by the Zambia Environmental Management Agency (ZEMA). Enoch Kavindele says the project is expected to move five million tonnes of cargo annually and create over 8,000 jobs for the locals. The North-Western railway project will be done in two phases with the first phase expected to gobble about US$500 million and about US$600 million in the second stage. According to Kavidendel, "the engineers will move in, in the next two months to come up with the designs for the project .This will be a one-track heavy duty line designed to carry five million tonnes of heavy cargo per annum". He said the railway project will provide a cheaper and easier mode of transportation of copper by mines in the area with the recent increased investment in mining sector in North-Western Province. Thid is a welcome development. And it will certainly sound the death of TAZARA. There's currently not enough demand to sustain both projects even with Trident and other mining developments in the area. NWR is talking about a business model sustained by 5m tonnes of cargo. Well, mining will only be around 1m tonnes by 2015. This seems wildly optimistic. One hopes they are working with better numbers. I have reviewed the "impact assessment" submitted to ZEMA and it seems very poor on the key demand projections of traffic. The economic case has not been demonstrated. It is more of a strictly environmental assessment. Let me highlight a few issues that you may not be aware. Firstly, the 5 million tonnes is the design capacity i.e. the track will be designed to be able to carry 5 million tonnes, but the break even tonnage that makes the project viable is 1.5 million tonnes which is achievable. The current tonnages available with current mines in northwestern is close to 1 million tonnes of copper ore. This ore is processed on the Copperbelt and for FQM in Solwezi. There are four other mines coming up within the next three years that will increase tonnage to over 2 million tonnes. With rail new opportunities will arise in agribusiness, cement exports to Angola and future fuel products imports from Angola. The main reason for this rail is the need to transport copper ore into the Copperbelt and so there is still need for ZR and Tazara to remain as a complementary support service since they are the lines with links to seaports. So actually NWR will be a complement to the rail industry and will not in any way lead to the demise of TAZARA. In fact NWR plans to have strategic alliances with both ZRL and TAZARA. The first phase of the project is Chingola to Lumwana which is a 300 km stretch and then second phase is the link to Angola rail. The Northwestern province is the future Copperbelt of Zambia and with a rail in place that whole region including the DRC and Angola will open up to huge opportunities for trade and investment which can only be good for Zambia and the SADC region. Also it will give Zambia Railways and TAZARA to carry cargo from Durban and Dar ports respectively all the way through to Solwezi to Jimbe and to Lobito on the Atlantic Ocean. The project has been independently assessed and has undergone a pre-feasibility study and detailed feasibility and viability study. Government plans to widen its School Feeding Programme. The existing GRZ programme as so far only provided food for a paltry 800, 000 school children across the country, over the last 10 years - against an estimated 3.1 million vulnerable school children annually that need to be on the programme. One of our readers, a teacher in Mwinilunga, reports that year his school has received 56 25KG bag of mealie meal. This year they recieved 56KG bag of maize and 36 2.5liters of cooking oil. It is regared as a helpful programme to learners who come to school "with an empty stomach". In his words, "even absentism has reduced because pupils come to school knowing that they will eat". The programme at that school has has been funded by WFO, UNCDF, UNESCO, PAM in collaboration with GRZ. Expanding the programme therefore has clear benefits. However, it is being done without any regulatory framework - there are no defined applicable standards, both in terms of food and its calorific value. A new regulatory framework would seek to define how much a child needed, the times the food should be provided, and determine whether the programme should be the responsibility of the Ministry of Agriculture or Ministry of Education or indeed be jointly run by the two ministries or completely separate entities. A UK's Financial Times article says demand for emeralds is on the up, with jewellers such as David Morris and Bulgari confirming that the green gemstones are fast becoming a popular alternative to white diamonds. According to statistics from the UN Commodity Trade Statistics Database, sales of diamonds have been slowing while those of emeralds and other coloured gemstones have been mounting significantly in recent years. Clockwise from below left: Fabergé Solyanka ring; Avakian emerald and sapphire necklace; Gemfields, Zambian emerald bracelet by Octium; Graff ultra-versatile double brooch. Zambia is the third largest producer of gemstones in the world. Gemfields, the London-headquartered company with interests in Zambia's Kagem Mine that produces 20 per cent of the world’s supply, has clocked up impressive sixfold growth in prices for higher-quality emeralds over the past four years, and sevenfold growth for lower-quality stones. I have previously noted that the challenge for Zambia is to get the policy right without stifling much needed foreign direct investment in this sector. It is particularly vital that policy in this area moves towards greater evidence based policy making and more promotion of transparency within the industry as a whole to ensure long term benefits to our poorest. In that sense the current discussion around "restricting sale" of emeralds to Zambia seems to miss the point. The question of where the emeralds are traded is pointless. In fact it is poor economics to restrict the trade to Zambia because the trade should occur where they can get maximum value. The reason Government wanted trades in Zambia was to monitor what was being sold. Restricting the sale for those reasons is not only using a a heavy hammer to crack a nut, bu it misses other better options. For example, why can't government simply focus on ensuring they have a stake on all the eremald companies in the same way they already do with Kagem (and some copper companies)? That way they have a better handle on information and they can help companies focus on investing more in Zambia, etc. But most importantly, the additional benefit of restricting trades locally seems to be negligible. The Government has now put in place various statutory instruments that already mandate revenue transfers back to Zambia within 60 days. We also have a new Minerals Development Commission with the task of veriifyng production figures across various sectors. That being the case, there's no additional benefit that I can see, from a transparency perspective, of restricting gemstones auctions only to Zambia. In other words, the additional cost in lost value of such restrictions will clearly outweigh any pyschological benefits. President Sata is spot for so many reasons - which are self evident. I am equally impressed with the way the President dealt with another laughable proposal to introduce "African passports". How can you have a common African passport regime when you can't even implement a regional visa regime? The AU is currently a failed project because everyone is a member from corrupt dictators to reformers. Murderers and saints sit as equals! What Zambia should do is to press for its reform or better for it to be disbanded. The current AU framework is based on being merely African rather than serious economic and democratic principles. Zambia hosted its first ever Emeralds International Conference last week. Held over two days, the international conference explored : ways of how the sector can be developed into a world leader while ensuring that relevant revenues and profits accrue to the government; issues affecting small miners; adding value to gemstones; environmental issues; and, international auctions. Zambia is the third largest producer of gemstones in the world. It is remarkable that such a conference is being held only for the first time. The organisers are to be commended. One hopes this will be a annual event..
Sean Gilbertson (CEO Gemfields) gave this excellent presentation. I particularly draw your attention to the slides on "myth busting" which helps to improve our knowledge of the real issues. Also the policy recommendations are excellent. It is vital that our policy makers begin to take seriously the issues raised - so that our poorest people can have a win win situation. We need evidence based and transparent policy making in this sector to ensure policy decisions add value in the long term. The issues facing this sector are many and therefore there's great need for ongoing dialogue. This is only partly true. It is not the whole truth. A subsidy can also be given to producers for export purposes. In other words you can subsidise an agricultural good, for example, just to increase the share of your exports abroad. So a subsidy is not always about domestic consumers. Under the export subsidy scenario, domestic consumers effectively pay relatively more than foreign consumers (adjusting for transport costs etc) – because without the “export subsidy” foreign consumers would have bought a relatively more expensive product. Domestic consumers also pay more in absolutely terms because these consumers pay taxes which goes on those export subsidies. Inflation rate climbed up in May. It stands at 7.0%, up from 6.5% in April. The inflation measure is a year on year measure. So this means are 7% higher in May 2013 compared May 2012. The increase in fuel prices has undoubtedly affected the rise. GRZ removed fuel subsidies on May 1, increasing the cost of gasoline and diesel by more than a fifth. The Bank of Zambia responded by increasing its benchmark interest rate for the first time in seven months. The policy rate was raised by 25 basis points to 9.5 percent. The BoZ statement notes : “The committee anticipates upward risks to inflation during the month of June 2013, mainly arising from the recent increase in the pump price of fuel, coupled with the lagged effects of the recent exchange-rate depreciation". It goes without saying that the Government is unlikely meet its projected inflation level of 6% for 2013 due to further expected increases in food and electricity prices. 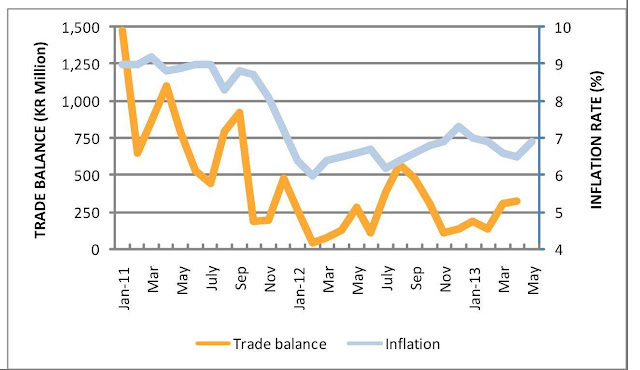 The continuous depreciation of the Kwacha will continue to increase inflationary pressures on imported goods. The Kwacha has declined by 3% this year. The current debate about the democratic reform of the Republican constitution provides an invaluable opportunity for the profound rethinking required. A good constitution, while do doubt necessary for resolving the deep-rooted crisis in the political system, is nonetheless not in itself sufficient. The main issue is not the formal model of governance, but the real life relations of governance that need to be re-established between State and Society. The Constitution can only lay the foundations for reciprocal and hence deeply democratic relations of governance. The decisive factor will always be the style of governance and the skill of the leadership in establishing an effective basis for trust and loyalty. Gould wrote that in 2010. It is still true in 2013. That last sentence in particular has never been more important. There's an important reason why "style of governance" is vital. That is because no institutions exist in a vacuum. They are put in place and made to work by people. If the top leadership are not decisive in subjecting themselves to the institution, the rest of society wont value the institutions. In other words, style of leadership from the top matters because change is top down. What the top signals matters a great deal. In a way there's a sense in which Zambia's current predicament has always been a failure of leadership. The question of what the minimum statutory retirement age should be has sparked debate in recent weeks. This follows the announcement by the President that new government will seek to increase the minimum pensionable age from 55 years to 65 years. The new minimum state pensionable age would remain mandatory to the public and private sectors, with all employees continuing to make their contributions to NAPSA through their employers, as set out under existing legislation. Given the centralised and heavily regulated nature of the current pension system, it was inevitable that the new policy direction on state pension would spark debate. The Government’s proposal appears to be based on the belief that increasing the minimum state age of retirement is absolutely necessary because the current age limit discriminates against those who are willing to work longer. President Sata explicitly noted that “people still wanted to continue working even after they had retired hence the need to up the retirement age to allow the ones that want to continue working to do so”. This is not only fair, it is argued, but also makes economic sense. Increasing the age limit will allow experienced employees to continue contributing to national economic life. In short, the Government’s argument is based on fairness and preventing lost output.